Electronic Health Records 3 Edition Hamilton, Electronic Health Records, 3e is the top choice for training students using live and up-to-date SpringCharts EHR software. 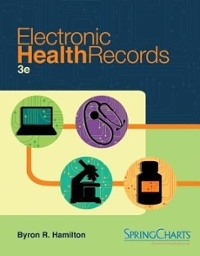 Electronic Health Records 3e builds transferable medical documentation skills with a variety of exercises that walk students through different facets of using an EHR in the medical office. As students progress through SpringCharts, they learn to gather patient information, schedule appointments, record examination information, process lab tests, select codes, and more. Students who complete this course will learn the appropriate terminology and skills to use any EHR software program with minimal additional training. The practical, systematic approach is based on real-world medical office activities.